What better way to cap a fun-filled day on the mountain? Sit back and let the power jets do their magic. You might not mind getting cozy with your crew, but it's so nice having your own space for power naps and quiet time. Sit down to a home-cooked meal. Fully equipped kitchens are perfect for making your famous enchiladas. Modern amenities meet Colorado kitsch in these charming slopeside suites. It'll feel like your own family cabin. Get ready to hit the slopes. Snowflake Ski Lift is a 5 minute walk away. Head downtown for Main Street shopping, dining and entertainment. It's an 8 minute walk away. The resorts' 2 outdoor hot tubs are the perfect place to relax after a long day on the slopes. Grab your shoes & go, Spruce Creek Trail is just a 10 minute drive from the resort. Book a tee time at Breckenridge Golf Course, just a 9 minute drive away. Pine Ridge Condominiums is a peaceful property located in the quaint 4 O’clock neighborhood of Breckenridge. It’s a setting so scenic, you’ll want to snap some family pics (holiday card material for sure). Here you get the easy access of a ski-in/ski-out lodge, but without staying right by the hustle and bustle of the ski village. Rent any ski and snowboard equipment you need at Christy Sports, located right onsite. Once everyone’s fully fitted, warmly dressed and raring to hit the slopes just mosey outside and take the short walk to the Snowflake Lift which will take you and your crew up the mountain to explore the rest of Breckenridge Ski Resort. With 34 lifts, 187 trails and over 300 inches of snowfall it’s no wonder Breck is one of the most-visited ski spots in the Western Hemisphere. For a next-level snow day hire a private guide from the ski school for your crew who’ll show you all the best runs and trails on the mountain. When you arrive back at the resort after an adventure-filled day, discuss dinner options with the group. If nothing but a home-cooked meal will do the trick then whip up your signature dish in your fully equipped kitchen. After the feast, see who’s up for a soak - there are two outdoor hot tubs at the resort, ready to soothe your weary limbs (signs of a day well-skied). Brave the brisk temps on the quick walk, it’ll be so worth it once you get there. Each one- and two-bedroom suite is spacious and homey, individually decorated with just the right amount of alpine charm. Want a bit more space? Book a two-bedroom with the bonus loft - perfect for larger crews. Full kitchens have everything you need to make everyone’s favorites. The kids will be begging to help make your famous chocolate-chip cookies (and be the official taste testers). Inviting living rooms with cushy couches and flat screen TVs are perfect for when you feel like a night in. Swing by the front desk with the crew to peruse the resort’s selection of DVDs available for rent. Gather everyone on the couch, pop some popcorn and settle in for a movie marathon. Pack light and let the in-unit washer/dryer do the heavy lifting on the laundry scene. The resort offers light housekeeping, so you always come back to a tidy suite. 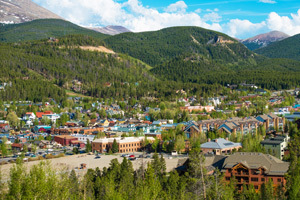 Pine Ridge Condominiums is only two blocks from the enticing array of shopping and dining of Main Street Breckenridge. You’re sure to find a unique souvenir. Shirt Off My Back sells custom embroidered apparel, while local favorite Swan Mountain Christmas sells a wide selection of gorgeous ornaments (and is open year round). For a casual dinner head to Downstairs at Eric’s for some pizza and burgers. For great drink specials and a taste of history check out The Gold Pan Saloon and Restaurant, opened in 1879 and known as “the oldest bar in Breck.” If you want to explore beyond Breckenridge, the Outlets at Silverthorne is a shopaholic’s paradise and it’s only a town away. Guests that are planning to arrive outside the normal front desk hours can pick up keys from a "Late Arrivals" box at the front desk, which is located in Building 6. For more details please contact the property using information on the booking confirmation.